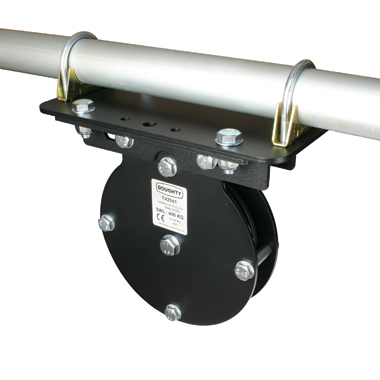 Universal mounting plates enable pulleys to be mounted to a tube via a pair of 'U' bolts. These plates have been designed to mount a pulley parallel or perpendicular to a tube. All universal plates are supplied with a pair of mulitbeam brackets and 'U' bolts to suit 48 - 51mm diameter tubes. ie. T42901 + T42979 = 100mm Heavy Duty Single Pulley (for wire) fitted with a Universal Mounting Plate.